The Devils playoff hopes are fading quickly. Coming into tonight’s game New Jersey sat 5 points out of a wild card spot. With injuries to Stephen Gionta and John Merrill, the Devils came into tonight with 2 more of their key players out of the lineup at a crucial time. Because John Merrill was unavailable to play tonight the Devils recalled a familiar face, Adam Larsson. Larsson was slated to play alongside his partner from earlier in the year, Eric Gelinas. With back to back games scheduled, Coach Deboer chose to start Marty Brodeur against Florida and Cory Schneider against Buffalo. The Devils knew they needed to start the first period off strong after the consecutive losses they suffered their last 2 games. Patrik Elias emphasized this in his pregame interview. That’s just how the Devils started. Travis Zajac scored his 14th goal of the season just 12 seconds into the first, assisted by Jagr and Fayne. The Devils did not let up with their energy throughout the rest of the first period. The Devils outshot the Panthers 6-1 in the first five minutes of the first period. New Jersey would cash in for their second goal when Jagr extended the lead off a steal. Jagr scored his 24th goal of the year at 9:24 of the first period, assisted by Ryane Clowe. After Jimmy Hayes took a penalty for hooking at 10:08 the Devils went to work on their 9th ranked power play. Travis Zajac scored his second of the game and his 15th goal of the season at 11:33, assisted by Ryane Clowe and Eric Gelinas. After failing to score more than 2 goals in 3 out of the last 4 games the Devils scored 2 within the first 10 minutes of the first period and 3 in the first 12 minutes. At 15:46 of the first Ed Jovanovski took a double minor for roughing against Ryan Carter. Scoring on their first power play chance, the Devils gave up a shorthanded goal to Dimtry Kulikov his 8th goal of the year at 17:22, assisted by Nick Bjugstad. The Devils registered 18 shots on goal in the first to Florida’s 4. The Panthers came out in the second period and looked to have more confidence. The shorthanded goal seemed to let the Panthers back into the game as Brad Boyes scored his 20th goal of the season at 0:50 of the second period, assisted by Bjugstad. The Devils came right back and on a 2 on 1 Ryane Clowe scored his 7th goal of the season at 3:05, assisted by Zajac and Jagr. Just 3:30 later the Panthers would fight back on Brandon Pirri’s 10th goal of the season at 6:35 of the second period, assisted by Olsen and Trocheck. The third goal by the Panthers spelled doom for Brodeur as Coach Deboer pulled the future hall of famer and replaced him with Cory Schneider. At the end of the second period the Devils led in shots 25-17. After Zubrus took a holding penalty at 2:57 of the third the Devils returned the favor of scoring a shorthanded goal. Jacob Josefson scored his first of the year at 4:02 of the third, assisted by Ryan Carter. The Devils continued their scoring parade when Travis Zajac recorded his first career hat trick scoring his 3rd of the game and 16th of the season at 9:37 of the third, assisted by Ruutu and Jagr. 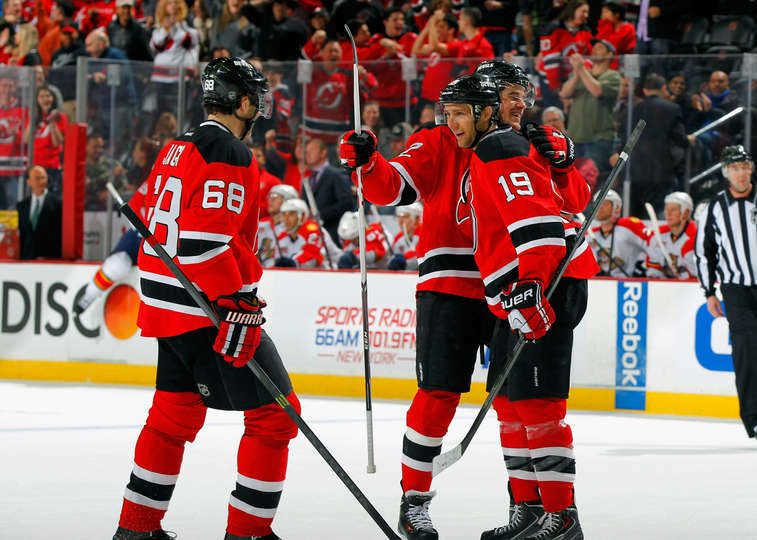 With their playoff hopes on the line the Devils came out strong in the first, although they faltered a bit in the second they nailed down the coffin and secured the win with a strong third. None of the teams New Jersey is chasing were in action tonight so they now sit 3 points out of a playoff spot behind Columbus. The Blue Jackets, like the Devils, are in action tomorrow night. If the hockey gods are kind to the Devils they could sit 1 point out of a playoff spot and jump over both Washington and Toronto. First and foremost the Devils need to be kind to themselves and take care of what they can control. If and it’s a big if all things go well the Devils will only be chasing Columbus. Which Devils team will show up tomorrow night? Next Story → Rangers Persevere…Advance to Stanley Cup Finals!